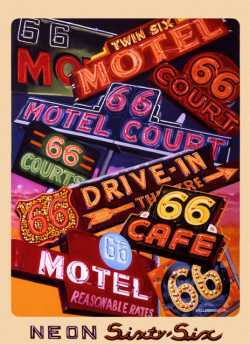 Welcome to McJerry’s Virtual Route 66 Gallery. I hope you enjoy perusing this selection of watercolors, oils and pencil artwork. Many of these works are to be found at my gallery in Chandler, Ok, while others are examples of past paintings. Please inquire about purchasing available artwork, or scheduling special commissioned works (great for gifts). 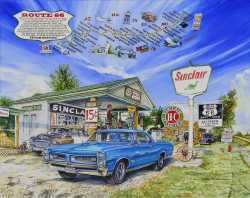 In 2013, Curtis Gobeli celebrated turning 66 by driving his beautiful 1966 GTO from Minnesota and down the length of 66. He stopped to visit Gary Turner on June 6! He commissioned this watercolor to celebrate the trip and visit. Curt and I met back at Gary's on 5-17-14 and held a party to unveil his painting. Regular non limited 13x19" prints are $40.oo each (plus shipping). 8.5x11 prints are $15.00 each (plus shipping). I will sign these! 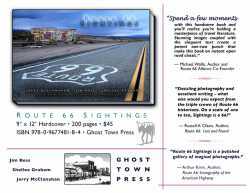 One of the Route's most famed and loved Motels, and home to Bob and Ramona Lehman since 1971 (as reflected on my tribute to them on the 52 Lincoln's liscense plate! 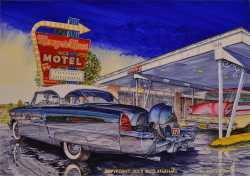 Reflected in the long car's black paint are the bowling alley and motel across the street, while the puddles left by the passing storm reflect the Lincoln's wheels. Price: $6,000 (plus shipping/crating) prints are avalable. 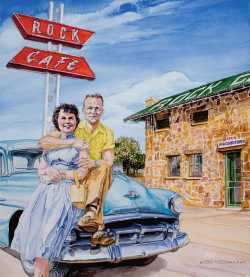 18x20 original watercolor of the famed Rock Cafe, with former owners Ed and Alita Smalley posing in front. Price: $3,500 (plus shipping/crating) prints are available. Numerous entities used the "twin sixes" on their neon signs over the years. This image hosts a sampling of these brilliant tributes to the Mother Road. Price: Available as high quality inkjet color prints on heavy duty glossy 13x19" paper ONLY. $40 each plus shipping. I've started printing out and displaying some of the photos I have been taking at car shows and swap meets. 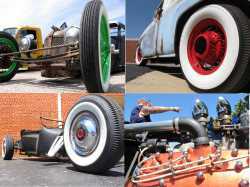 I enjoy shooting from an unusual angle and trying to find the most interesting view of cars, bikes and trucks. These are a sample of the 13x19 prints that I have for sale in my gallery. Price: $40 each plus shipping high quality heavy duty paper inkjet prints ...please inquire for ordering info.